When we were younger, Halloween was the holiday we spent the majority of our seasonal decorating dollars on. We embraced the day completely including spending a couple hundred dollars each year on candy to give out and finding cool Halloween costumes. We would blast spooky music while running the fog machine and sometimes convert our garage or front entryway into a haunted house. 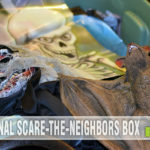 While we celebrated Easter, Thanksgiving and Christmas, we didn’t immerse ourselves quite as much as Halloween. We’ve actually owned various types of Christmas decorations including Winterberry dishes for years but I seldom have even bother to unpack them. Until the girls were born, there were a number of reasons we preferred to avoid the hubbub of Christmas. It wasn’t until a handful of years ago that the girls encouraged me to incorporate more decorations into our living space. 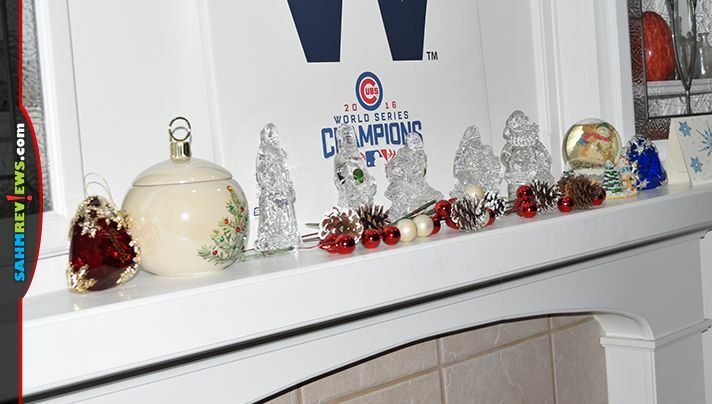 As an example, this is the first year since receiving my Waterford Santa figurines over a decade ago that I actually displayed all of them on the mantle. Each year I pull something new out of storage or maybe purchase one small thing to jazz up the space. 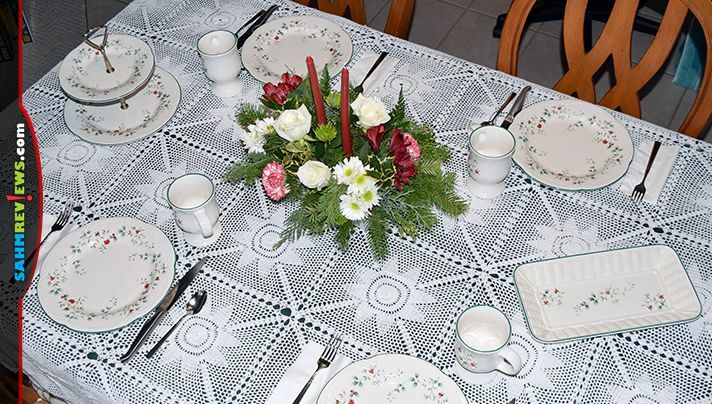 I’m far from creating anything Martha Stewart worthy but this year I even pulled out a lace table cover to go over our regular green tablecloth. I also unpacked some of the serving pieces that go with our dish set. 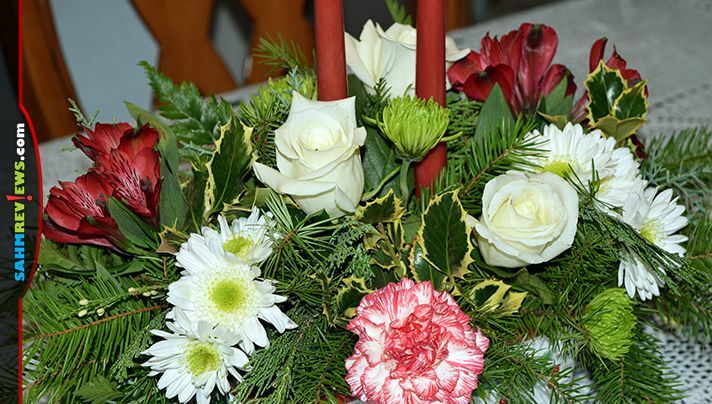 Of course, I’ve also reached the point where I like to add a beautiful holiday bouquet to the table as a centerpiece. The ornament decanter was so adorable last year and fit right in on the mantle this year. I decided I wanted something that I could include in my decorating next year so I opted for Teleflora’s Halls of Holly Centerpiece. 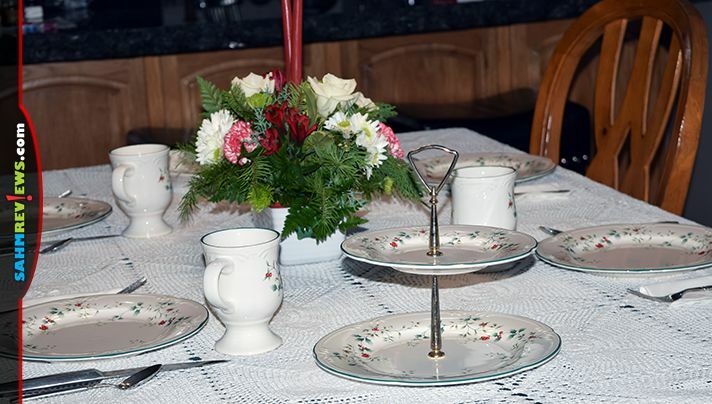 The design blends nicely with the Winterberry pattern on the dishes! One of the exciting things about picking out a holiday bouquet – either for myself or someone else – is that I know it’s sure to garner smiles for quite some time. While the centerpieces and bouquets are very similar year over year, the designs of the collectible and keepsake decanters are usually unique. Our bouquets always last at least a couple weeks then we have the decanter or vase to use after the flowers have lived their life. 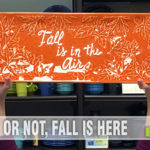 The “vase” that comes with the Halls of Holly Centerpiece isn’t just any kind of vase or decanter, it’s actually an FDA-approved food-safe stoneware dish! It’s beautiful with flowers in it but after that we can look forward to using the dish in the oven, microwave and dishwasher! 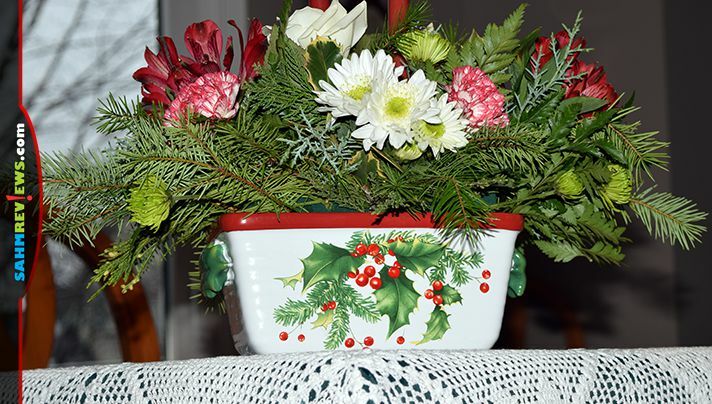 In case you’re curious, this festive dish is available in a couple designs and sizes of Christmas arrangements so be sure to peruse the selection and find one that would fit your budget and make a nice addition to your holiday decor. Don’t need a stoneware serving dish? There are a number of other bouquets and vases that are festive and fun. 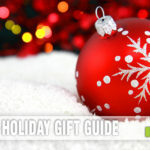 From decorative food-safe gingerbread mug to a Thomas Kinkade keepsake, there are plenty of other options. I’m also blown away by how gorgeous the winter elegance arrangements are. 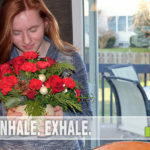 Christmas bouquets and Hanukkah flowers make lovely gifts for the person who is difficult to buy for or perhaps for someone who could use a pick-me-up during the holidays. They’re also awesome gifts simply because they bring joy and keep on giving over the course of the holiday season. You can also order a bouquet for yourself! 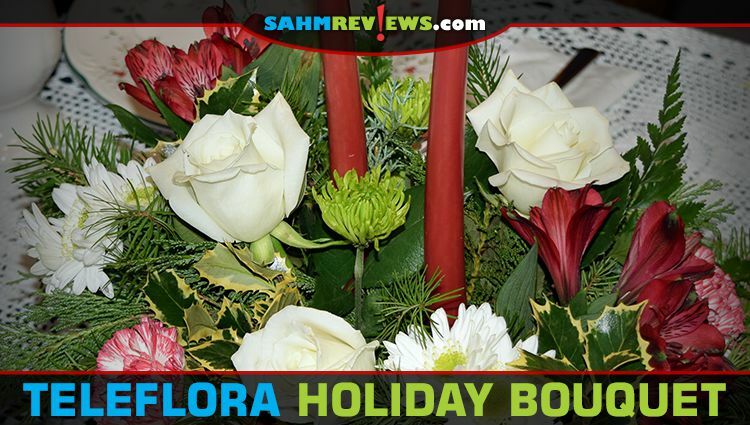 Be sure to check out the other Teleflora features to see what we think of their products. There’s also a little time left to enter to win a holiday arrangement as part of our annual Mega Giveaway! Which festive bouquet do you like the most? The flowers,table and mantle are really beautiful. Fresh Teleflora flowers and some key decorations can add a lot. Flowers are great to make a home look more homey! They go with everything! That is beautiful.I love fresh flowers. They just look so pretty in the home! It’s beautiful. Flowers really brighten up the room on Winter days. Flowers are one of my favorite things on earth and they always make a table so beautiful. I especially like that Teleflora has such a nice selection of the keepsake decanters. Wow, I didn’t realize you could use the dish afterwards. Amazing how the arrangement can make your table look so inviting and then you can have a new dish too. I agree, flowers do make everything look alive. I love using flowers all year long. This is the first time that I’ve had flowers delivered in a reusable food-safe dish, Karen. I didn’t know that was a thing but it’s an awesome idea! Flowers are such a special gift. They can just instantly brighten someone’s day. It’s even better when they come in beautiful containers that the recipient can keep and reuse.